A congested Queens street turned into a demolition derby, jaw-dropping video shows, and the person behind the mayhem was apparently an NYPD traffic agent. 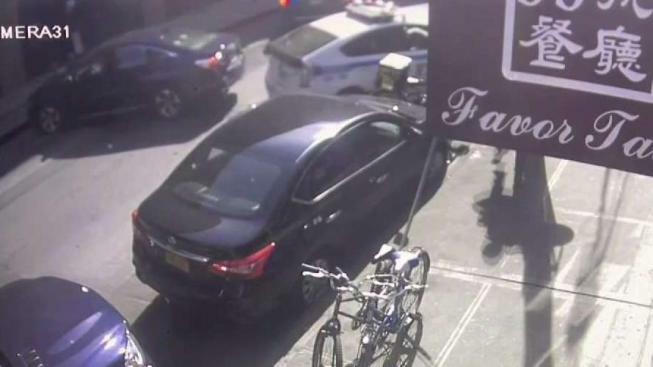 The chaos, which unfolded Saturday on 37th Avenue near Main Street in Flushing, was all caught on a surveillance camera. The shocking video shows the NYPD car slamming into the sedan in front, then backing into the car before gassing into the front of the vehicle one more time. A different angle then shows the NYPD car crashing into another car, this time a large van. The traffic agent is then seen jumping out of the car as stunned witnesses stare in shock, frozen in their tracks. The NYPD says the driver appeared to be disoriented and was taken to the hospital for evaluation. There was no word on the conditions of the drivers in the cars that were hit. The crash remains under review by the NYPD. It wasn't clear if charges were expected to be filed in the case.